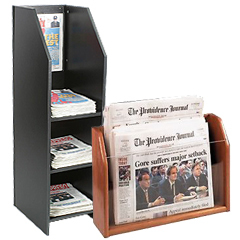 Need to buy newspaper racks for your newsstand or corner store? 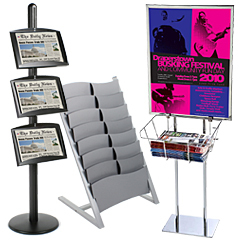 These periodical stands are perfect for selling daily, weekly, and monthly press publications in a retail setting. 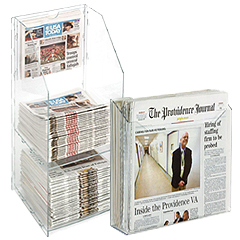 The newspaper racks, or periodical displays, are also great for visitor and community centers where they help distribute free information. Tabloids are hot sellers in grocery stores, and these newsprint holders make it easy to sell more! Many merchants set up newspaper stands near other literature shelves to expand their offerings and entice customers. The periodical displays are twice as effective in these kinds of settings. Showcase the latest press article or news story with one of these stands to ensure higher newsprint sales! What are the different types of periodical displays for sale? 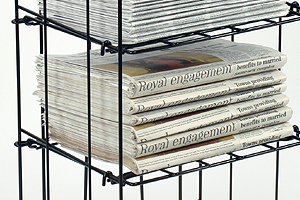 Newspaper stands come in several materials, including wood, wire, metal, plastic, and acrylic. The durability and price point varies from one option to the next, so consider the application when making a purchase. Think about where the newsprint rack will be set up, for how long, and consider the amount of traffic it will get before deciding on the material. Another distinguishing factor of these periodical displays is the configuration. We currently offer floor-standing systems, countertop holders, and even wall hanging racks. Floor stands are very popular for retail settings. Countertop models are also commonly used in sales environments. These compact units can be set up next to cash registers and checkout areas to encourage last-minute impulse buys. The wall racks are suitable for many applications, especially when floor space is limited. The material and configuration depends largely on your specifications, but each style features one or more broadsheet sized pockets to easily accommodate daily papers, weeklies, and monthlies. Some of the periodical displays and newspaper holders include an area to insert signage. 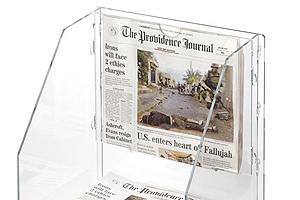 Many of the wire racks feature sign channels that are perfect for listing the name of the paper or other publication. Users are able to add a logo, so avid readers can quickly identify and purchase the newsprint. Similar units have a signage clip, sometimes called a header, at the top that can hold standard retail labels and cards. Other designs come with a broadsheet pocket that fits a single paper. This type of configuration is great for prominently displaying the top story or cover of the newspaper. The vertical pocket ensures the tabloid or paper is highly visible and will be recognized at a moments notice. Still there are other holders that come with full-blown poster or sign frames. Many of these are formatted for larger graphics that can grab attention from across the room. The combination of the literature display basket or tray with the sign frame is sure to draw in potential clients. When news hits, you need to be ready with the right tabloid and daily paper displays. That top story is certain to bring in customers. You just have to make sure to complete the sale! Our newspaper holders present press articles in a professional way, so customers are more likely to make a purchase. Both display-style and stack-style holders provide an effective way to market the information. Even in the case of free papers, distribution goes much more smoothly when the newsprint is organized into a neat stack or inserted into the vertical pockets. Long-lasting design is extremely important for fast-paced businesses. 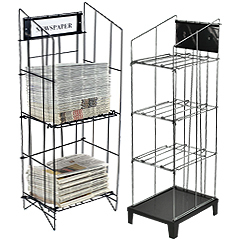 Classifieds are usually printed weekly or monthly, so news dealers need to ensure that their wire, metal, wood, or plastic holder is durable and will withstand frequent use.